2011 was a great year for our family. Our youngest is 4 years old now and it seems like maybe we are out of the recurring baby stage of life (which is oh so bittersweet) and able to press on with other goals. Now I have always had the goal of having a clean house and put-together life. And even now where I can focus more on that instead of folding cloth diapers, I find myself still struggling some days. That struggle leaves me frustrated and feeling powerless, which leads to bumps in my marriage and parenting. You know when you JUST cleared the clutter mountain off the kitchen counter and shined the back splash, and in the seconds your back is turned your husband tosses down his keys and your children stack up their daily art work, chapsticks, etc? Are you following me? Someone's getting their head bit off real quick, right? But wait. Deep breath. What's the bigger picture? What's the long term goal? That your children know to NEVER place ANYthing on the counter? Or is your long term goal to cultivate deep relationships with your family while providing a loving home? Well I had just gone through one of those counter-clearing-experiences and realized I need to grab a tighter hold onto some perspective. Three things happened right after my last temper fit (yes, I can laugh at myself). That Sunday at church our pastor preached on getting a vision. (Loved that message!) The second thing that happened was our Bible Talk got together and we talked about having personal "words" for the year. My friend Rose had chose "Prudence". For me, I chose "intentionality and forebearance". The last two years my word has been "self-discipline," and I think this years words definitely build on that. Then this lovely book from Simple Mom came up free through Amazon: Organized Simplicity: The Clutter-Free Approach to Intentional Living . This book helped me to collect the thoughts and ideas in my head into a simple, cohesive statement. Thank you Simple Mom! 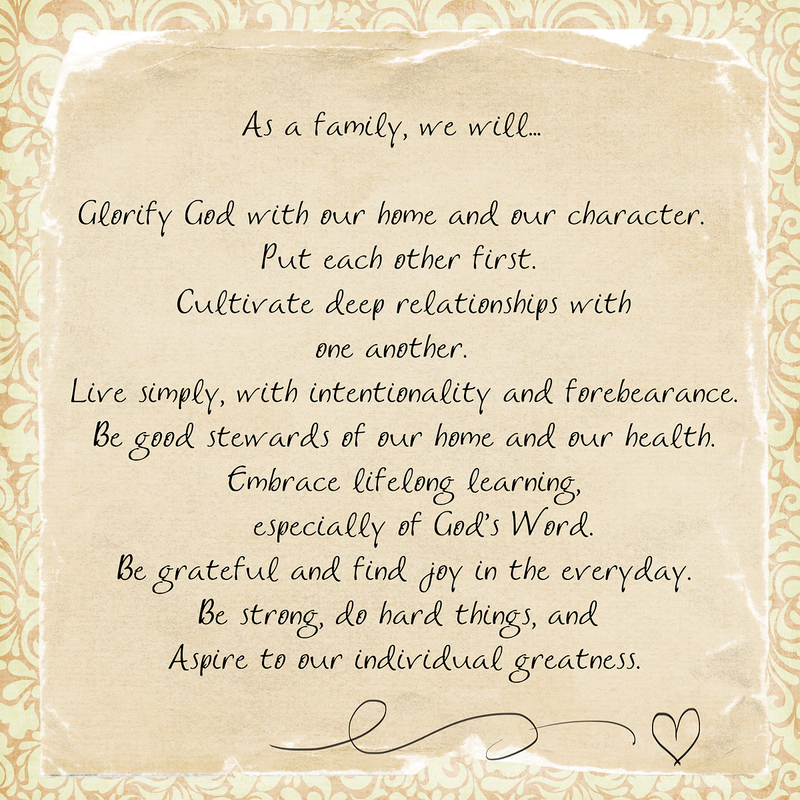 This is our family mission statement. I wouldn't say it is terribly unique, but it fits us. My husband has been trying to help us put together one of these for a long time and here it is. I hope it encourages you. This post is linked up with Homemaker's Challenge. Lots of great ideas.